She repeated that a US-US trade deal is off the table post-Brexit if the Good Friday Accord is compromised. U2 SINGER BONO was among those in the Dáil this afternoon to hear the Speaker of the US House of Representatives Nancy Pelosi speak. Pelosi, who arrived in Dublin yesterday, was invited to speak in Leinster House today by Ceann Comhairle Seán Ó Fearghail. In her address to TDs, senators and former politicians in the Dáil as part of centenary celebrations, she praised Bono, who was in the public gallery, for his music and advocacy work. Bono’s wife, Ali Hewson, was also in attendance today. She recalled how he played a concert around the time the Good Friday Agreement was signed, stating that to think the children born back then are now 21 years old and have known peace. While Pelosi addressed issues of climate change and announced her backing for Ireland’s bid to be elected to the UN Security Council for 2021–22, he main focus was on the Good Friday Agreement and how it must be protected in light of Brexit. She reiterated what she previously said this week – that a US-UK trade deal is off the table post-Brexit if the Good Friday Accord is compromised. She said this must include the seamless border between Northern Ireland and the Irish Republic. On the issue of climate change, she said the US and Ireland can do better, adding that they must work together. She recalled the visit of President Kennedy, who told the Dáil that while Ireland and the US were divided by distance, they were united in history. The US House Speaker said both Ireland and the US “know the joy of independence” and both “endured the traumatic experience of civil war and the satisfaction of rebuilding our nations”. “It is these mutual experiences that our nations affirm for each other and to the world our democratic values and commitment to freedom. When Ireland proudly proclaimed its independence our people stood together”. She ended her speech by saying God Bless America and Ireland. Pelosi shook Taoiseach Leo Varadkar’s hand before leaving the chamber. Meanwhile, there is a logjam in the Dail as TDs queue to shake hands with Bono. 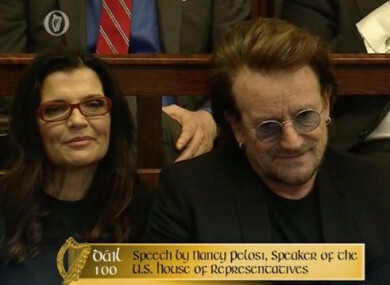 Email “Bono pays a visit to the Dáil to hear US Speaker Nancy Pelosi speak”. Feedback on “Bono pays a visit to the Dáil to hear US Speaker Nancy Pelosi speak”.